Some words carry a lot of energetic force. I think of them as "power words." This story is about two power words of particular force. They're words that we use all the time, from earliest childhood onward, but that doesn't diminish their strength, especially if we use them consciously and with integrity. Here's the story. I love road trips. You have time to really talk about things with your road partner. I got to have a nice, long drive with a good friend recently. Bliss! One of our main "talk-abouts" was an experience in which she'd gone along with something when she didn't really want to. Her inner voice had said "No!" but she hadn't heeded it. As a result she'd gotten into a really unpleasant situation. We delved into the concept of personal boundaries, speaking our truth and the importance of voicing our "No's" and our "Yes's." As we "threshed," we realized that our No's and our Yes's are "power words," acts of primal self-expression that need to be cultivated and honored if we are to live our lives fully. If we use them with full integrity and truth, they are sacred acts. About this time, my friend and I stopped at a restaurant for breakfast. The two-year old at the table next to us started lustily exercising her "No." Her mother handled it beautifully—which is to say, pretty neutrally. We listened, delighted, as the little girl loudly continued to resist everything her mother suggested. Her "no" was just "no," powerful, clear, and un-conflicted. A perfect little teacher of the Sacred No! energetically is percussive in nature and establishes structure. is melodic in nature and creates flow. 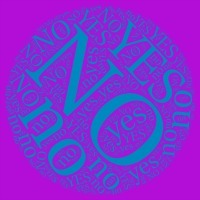 If we can get right with our Yes's and our No's, our lives will be so much cleaner and will flow so much more smoothly. Cultivating your Yes and No power words will help you live your truth and establish a beautiful balance in your life, between melody and percussion, structure and flow. To cultivate right use of these two ultra power words, practice listening for your inner voice, or listening to information from your body. A Sacred Yes often starts with a feeling of expansion. A Sacred No often starts with a feeling of contraction. Create an altar or a ritual to support you in walking the path of your truth, or wearing a particular item of jewelry or carrying a pebble in your pocket to remind you. Be creative and strong and exercise the power of your own integrity! Pay attention to small children who have not yet been fully socialized out of their Sacred Yes and Sacred No. Listen to how they use these words and watch how they hold their bodies as they do so. Can you tap into that in your own body? Pay attention to people whose lives seem to go smoothly. Watch HOW they handle saying no. They're probably pretty good at doing it in a strong but non-abrasive way. Also watch WHEN they say yes. Notice how they hold their bodies and you feel around them when they use either power word. Learn some "assertiveness" skills, either from a book or website, or from a class. Consider what things you would like to say no to, to stop doing. Write them down. Our tendency is often to think of reasons why we need to continue doing them. Instead of doing that, for each one list all the reasons why it IS possible or even good for you to stop doing them. Consider what things you could say YES to if you said no to the things you'd like to stop doing. How does that make you feel? Starting with small things, practice saying NO. Enjoy the space that this creates in your life before you start saying yes to new things. What do you do with that space? Let your Yesses "ripen" and season before you voice them. Of course, these are only two of a huge number of "power words." What other words hold special power for you? Are there ways you can bring them into your life more often, working with their energy to create a life that more fully reflects and nourishes your essence? Go from Power Words to Using Energy Healing To Enhance Your Life main page.